im listening to this band by the name of, Tortoise... interesting. ive been rather busy with this and that, working and getting fat. my board for the On Deck show killed me, nearly. it was attacked by a dog at the bus stop,i got makeup all over it... things werent blending the way i wanted them too... i had to drive way out of the way to even paint it, but i finished it and was the official last piece turned in. 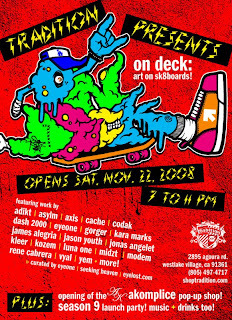 what is this On Deck thing that i speak of.... my generous friend Eyer curated a skate deck show at Tradition. it was awesome... and again, thanks to Eyer for putting the show on and having alana and i over, thanks to Andrew and Jason at Tradition for having us, big ups to Axis for taking us to Suru to see his show, and thanks to the friends that drove all the way out to Tradition for the opening.